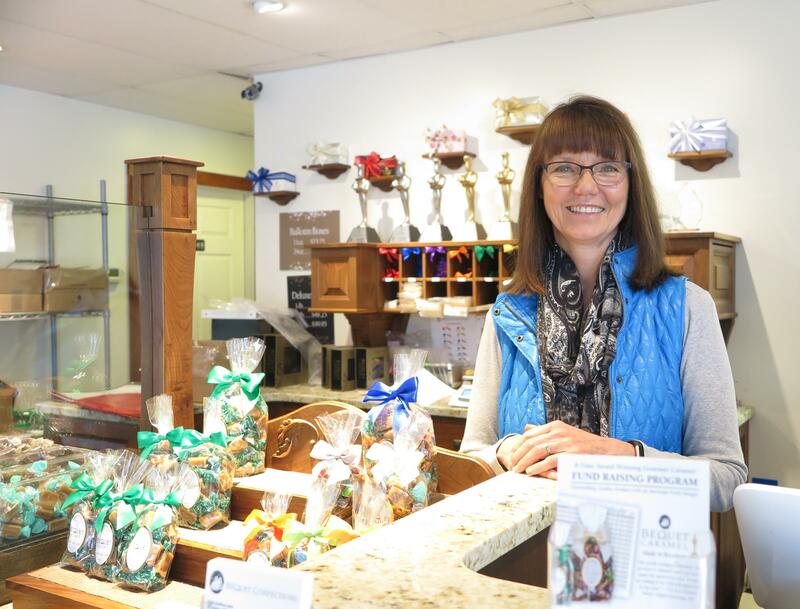 Robin Béquet, founder and owner of Béquet Confections stands behind the counter of her showroom in front of the national recognitions for here caramels. Rich buttery sweetness enveloped me upon entering Béquet Confections. I felt as though I was embraced by a good friend, in a place of joy and comfort. I was reminded of the sensations evoked by aromas of Thanksgiving dinner cooking and baking bread. 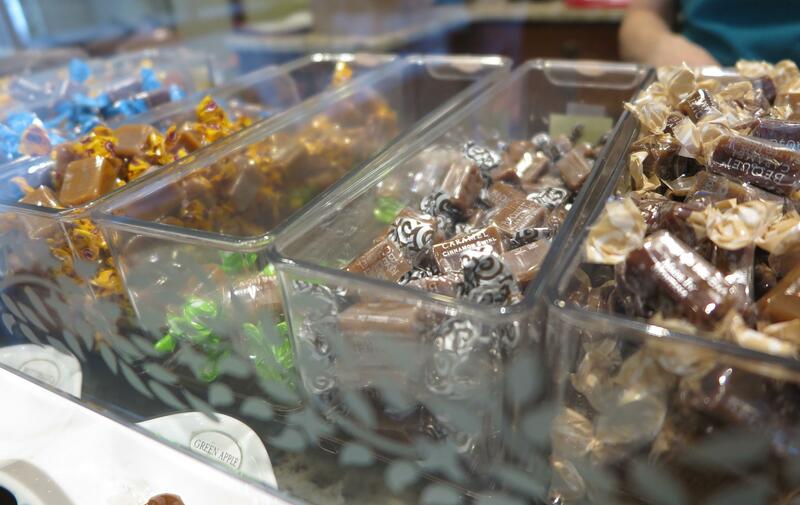 For years I have driven by Béquet Confections’ showroom near Four Corners in Bozeman. Every time I cruised past, I vowed to stop, but destination beckoned. I partly blamed the rush of traffic on Huffine Lane, the artery for Highway 191, that hurried me along. Instead of turning around, I looked longingly over my shoulder at having missed the driveway leading to the mecca of caramels. Entering, one inhales an unforgettable aroma. As I stood in the showroom I watched workers wearing showercap style head covers and gloves spread caramel into pool-table length trays. The mixture settled into a smooth surface reflecting the fluorescent lights above. The simmering caramel brew captivated me, the thick and viscous bubbles blurping to the top, releasing mesmerizing steam. 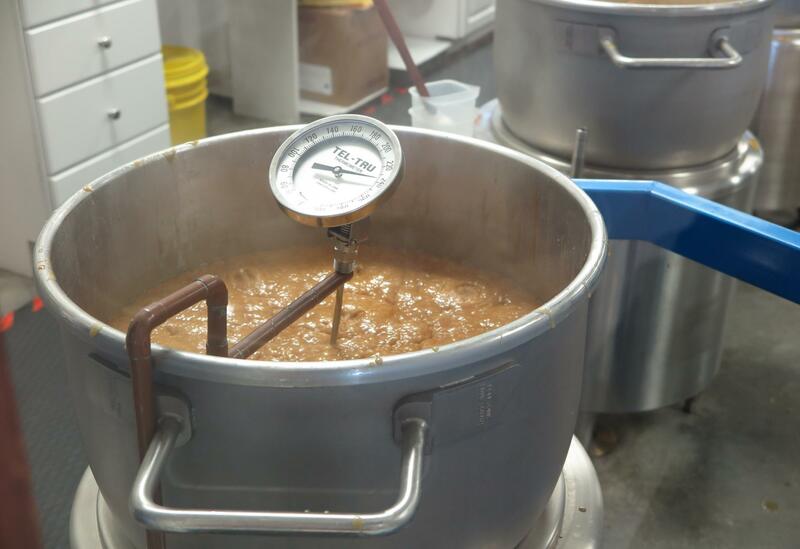 Caramel cooking in a large kettle for this day’s making of Celtic Sea Salt caramels. Béquet adhered to a bootstrapping business plan. The idea behind the strategy was starting a company from the ground up with limited cash and minimal outside assistance. After taking a mortgage out on their home, she fully embraced fiscal conservatism. She did her own market research, beginning with identifying markets she believed would be good places for selling the caramels. Her first test market involved friends and family but later she identified gourmet markets, natural food stores, gift shops, and coffee shops as potential outlets. “I remember standing outside Montana Harvest, the natural food store that used to be on Wilson, with my samples in hand and thinking to myself what am I doing walking into a natural food store? These people eat healthy, have I lost my mind? It was the professional in me that saw the potential market. I just said to myself: go in there and present that product and you are not allowed to turn around”. Béquet traveled to nearby cities of Big Sky, Livingston, Missoula and Helena and eventually to Spokane. Béquet Confections makes 13 different varieties of caramels. Each type has its own color and patterned edged wrapper. The business began in a small space in Four Corners that Béquet described as a “long alley about two bowling lanes in width.” Coincidentally, as the business was starting, her father relocated to Bozeman and was one of her first workers. During the three-year period they were in this building, Montana State University was looking for someone with a biological background very similar to hers. After doing the math, Béquet took on a full-time teaching position so she could manage the expenses of the business as well as hire a new employee. All the while she continued to work part time in her caramel business. Eventually she dropped down to part time work at the school. The turning point was winning the “Aisle-by-Aisle” award at the Fancy Food Show in New York. Béquet Caramel ranked amongst 17 best products at the show. The show is the premier food and beverage show featuring the latest in trends. The show provides a convenient and cost-effective way to meet buyers from major food and beverage venues in the United States and abroad. In the years that followed, Béquet Caramel went on to take the Sofi finalist awards for Outstanding Confection and Outstanding Food Gift at the Fancy Food Show, earning 7 awards for national recognition. 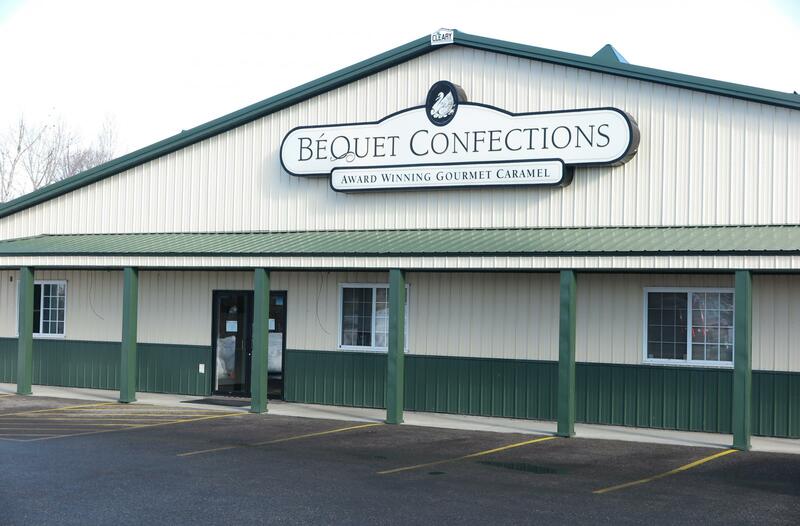 Béquet Confection is located on Huffine, Highway 191 business route, a short distance from Four Corners in Bozeman. Over the years, Béquet’s caramel recipe of sugar and dairy products has evolved five times. Subtle alterations are made to improve the taste and experience, but the enhancements are never announced. Béquet and her team do blind tastings all the time, comparing their product to those on the market. It is not unusual for her to receive a tray of 5 or 8 different caramels to sample and then make conclusions on modifications. They now feature 13 varieties of caramels, ranging from textural to spicyto salty. Acknowledging input from employees and consumers, Béquet and her team take comments seriously. On the week of Valentine’s Day this year, Montana State University Bozeman hosted the 31st Bug Buffet. I will admit to being repelled by the whole idea of insects initially. What is the beef about steak? At the table, with fork and knife in hand, do we really know and appreciate the food before us? In this program, we journeyed to the American Fork Ranch in Two Dot, Montana located under the Crazy Mountains to travel from pasture to plate.